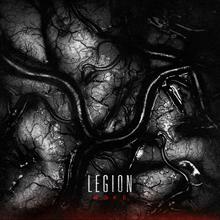 Ohio metal outfit LEGION have debuted a brand new song titled “He Became Death” off their forthcoming LP, “Woke,” due out July 30th, 2013. The band also reveals the album cover, track list and pre order information in one fell swoop. The band just finished up a batch of tour dates with BERMUDA with a final performance earlier this week in New York City. More tour dates will be announced soon.